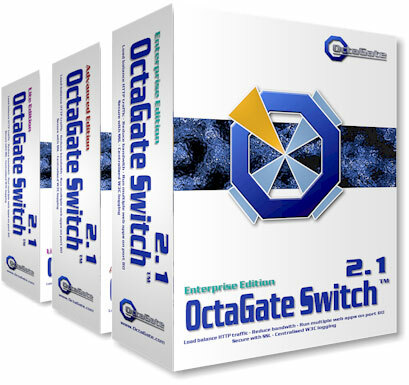 OctaGate Switch™ is the ultimate tool for any web admin. With OctaGate Switch™ you can configure your setup the way you really want it! Load balance your web sites, with failover! Reduce bandwidth usage by up to 90%! Secure your web sites with SSL! Run OWA and your web sites, all on port 80! Run many web applications, all on port 80! Move SOAP services without breaking existing code! Here are some screenshots of OctaGate Switch in action. Please download our new FREE trial version today and evaluate a full-featured version of OctaGate! OctaGate works like a switchboard, incoming requests are scanned for their destination, and the request is then forwarded to the matching server. This allows you to run several web servers on the same computer, all externally replying to port 80! Current OctaGate Switch version is 2.2.51, released on 2009-12-10.You can check our Change Log to verify what has changed for this version. OctaGate does not even require a separate computer, but can be run on an existing web server. Click here for a complete list of features. What OctaGate does can be called HTTP Switching, HTTP Forwarding, HTTP Redirecting or HTTP Tunneling. OctaGate looks at incoming requests and determines which web server it should route the request to.